After splitting two games in Northern Ireland, the Black Bears are back home for two games against Vermont. They enjoyed Thanksgiving dinner in the Titanic Museum, with replica furnishings from the grand ship. They also visited peace walls that once separated Catholics and Protestants in Northern Ireland. They marveled at natural wonders and castle ruins, but enjoyed the people most, especially during visits to schools. Oh, and the University of Maine men’s hockey team also played some hockey on its trip last week. Now the Black Bears are back home, preparing for a two-game weekend series with Vermont at Alfond Arena, and thankful for the memories from the Friendship Four tournament that included a loss to Providence and a win against Rensselaer Polytechnic Institute. “It was a business trip. We went to win two games. Only won one,” Maine Coach Red Gendron said. Some of the people were relatives. “I have some family in Ireland and got to meet some cousins,” said sophomore defenseman Patrick Holway of Cohasset, Massachusetts. His cousins made the trip to Belfast from County Clare in western Ireland. The trip also served as a week-long retreat for the team. “And their cell phones didn’t work as well,” Gendron said. Instead of constant phone checking, there were times for conversations. Now, can these Black Bears play together consistently? The results from the Belfast tournament were typical of Maine’s season so far. Except for a sweep by Minnesota-Duluth, every weekend has featured a win and a loss. The Black Bears are 5-7 overall, 3-4 in Hockey East. 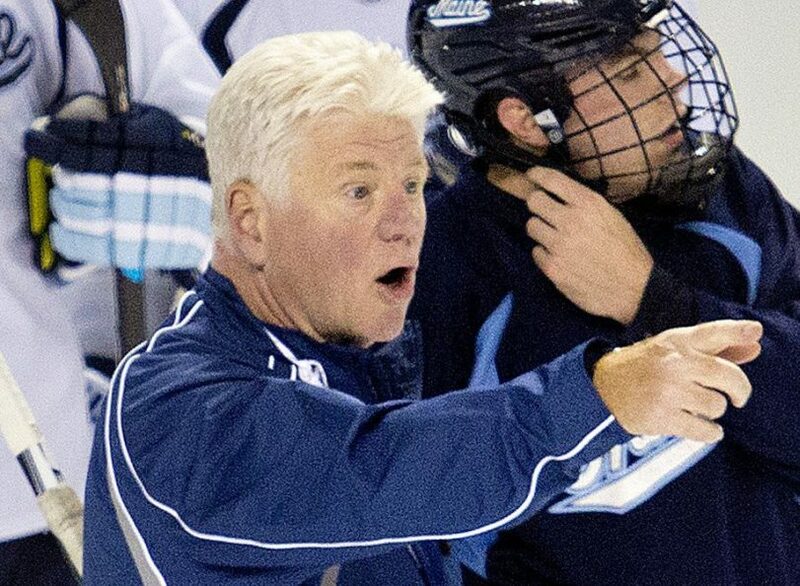 Gendron made similar comments two weeks ago in Portland, when his Black Bears lost a 7-0 rout to Boston University – a day after beating Boston University 5-2 in Orono. Maine leads Hockey East in penalty minutes (16.7 per game), and the Black Bears are next-to-last in team defense (3.42 goals allowed). If Maine is finally to get a weekend sweep, Vermont may be the right opponent. The Catamounts (4-9-1, 1-5-1) are last in Hockey East, though they snapped a four-game losing streak last Saturday with a 2-1 overtime win against Dartmouth. Vermont figured to be a strong defensive team with goalie Stefanos Lekkas, but he has received little support. The Catamounts have given up 3.07 goals per game. But their offense has been a bigger problem – a league-worst 2.21 goals per game (Maine ranks sixth at 2.83). Maine had been using a goalie tandem, with junior Rob McGovern and freshman Jeremy Swayman, but Swayman played both games in Belfast. He’s third in the league in save percentage (.921) and fourth in goals-against average (2.49). McGovern has an .875 save percentage and 4.42 GAA. “(Swayman) has been playing very, very well,” Gendron said. Friday’s game is at 7 p.m. Saturday’s game is at 5 p.m. and will be televised on WPME in southern Maine.